i attach too easily and it just leaves me empty. Infused with the heartbreak of David Sylvian, the musical sensitivity of Harold Budd, the piercing lyrical inquisition of black tape for a blue girl, and the personal insight of a man reflecting on the past five years of failure, Soulwhirlingsomewhere’s please sennd help is a strikingly personal album of acute soul-searching and self-awareness. 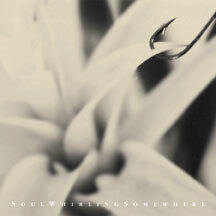 please sennd help – Soulwhirlingsomewhere’s 4th Projekt release since their 1993 debut – is driven by Michael Plaster’s delicate voice, atop an exquisite web of reverbed piano melodies, ambiently processed guitars and drifting electronic synthscapes. It’s an elegant environment, where a sense of realization and discovery prevails.